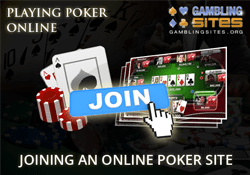 Getting started with online poker isn't very difficult, but we do understand that joining a site can be a daunting experience if it's your first time. That's why we've produced this step by step guide to help you through the process. All you need to do is follow this and you'll be up and running in no time. On this page, we'll talk you through the whole process of joining a poker site, starting with choosing which site to use and finishing with when you get to actually sit down and play. We'll explain exactly what you have to do at each step and provide you with advice and any additional information that we think might be beneficial for you. Choosing the right poker site to play at is the first step you must take and it's arguably the most important one. You have plenty of options but it's important to choose wisely. The specific wording of this step is both deliberate and important. You need to put some thought into which site is most likely to be right for you when you're choosing where to play, as just simply signing up at the first place you come across won't be as effective. There are a ton of sites to choose from but they won't all necessarily be suitable for you. You really don't want to join somewhere that isn't a good fit for your own circumstances and any personal preferences you may have. You may not even be able to join some sites, as many of them only accept customers from certain parts of the world. Some sites accept only North American customers for example, while others don't allow customers from the United States. Therefore one of the first things you need to do is to find out which sites will accept you. You also want to make sure that any site you're thinking of joining is safe to use. Most sites are perfectly reputable, but there are some which may not be trustworthy enough to handle your money and it's obviously in your best interest to avoid these ones. If you're starting to think that deciding which site to play at is really difficult, please don't worry. We do advise that you put at least some effort into making this decision, but it's certainly something we can help you with. We have written a detailed guide to choosing a poker site and for a simpler option we also have a list of recommended sites for you to choose from. You must open an account before you can start playing at your chosen site. Most poker sites make this very easy to do, so it shouldn't take long. The second step in joining a poker site is much more straightforward than the first. All you need to do is visit the site you've chosen and look for a button or link that says something like "Join Now" or "Sign Up." This will usually be somewhere fairly obvious on the homepage and clicking on either of these buttons will take you to a registration form. At this stage, you'll also usually have to choose your username and password. This is obviously a straightforward process but bear in mind that your username will be displayed to your opponents when you're at the tables and you may not be able to change it once your account is setup. It's in your best interest to avoid anything that might be offensive to others. For your own security and protection, it's also a good idea to choose a strong password that can't be easily guessed. Please note that it's likely that you'll have to confirm your acceptance of a set of terms and conditions before finalizing the opening of your account. These aren't particularly interesting, but it's still advisable to read through them. Most poker sites require you to download their software client in order to play. Instant play may be available as an alternative though. When sites require you to download their software client, they usually make sure that the process is easy for you. Things differ slightly from one site to the next, but you'll generally be prompted to download the necessary software as soon as you've opened your account. The download will then automatically start once you click to accept. You might have to select a couple different options during the download process, such as which folder you want to install the software into, but overall it's fairly simple. It's unlikely that you'll encounter any difficulties when downloading the software, but you can always contact customer support if you do. That's actually the best thing to do if you get stuck at any point when joining a poker site or if you have any questions at all that you need answered by a professional. You'll need funds in your online account to play for real money, so you'll now need to make a deposit. This is usually another simple process to follow. Most people find it easiest to use a credit or debit card, but all the options are pretty straightforward. It's basically just a matter of providing the necessary information (such as the credit card number and associated details) and then entering the amount you wish to deposit. If your deposit is authorized, you'll usually see the funds added to your account immediately. It's important to keep in mind that some of the above options take longer to be processed than others. Please note that some sites will add a processing charge to your deposits, although this is quite unusual these days. Beware, however, that it's common for a credit card transaction to be processed as a cash advance. This means that you may incur an additional charge from your credit card company, typically of 1-2%. A final point here is that you should make sure you're aware of any sign up bonuses you may be entitled to as a new customer. You are generally eligible for a bonus on your first deposit and you don't want to miss out on any extra value you may be entitled to. You should check to see if there's anything specific you have to do to claim it, as there may be a bonus code you have to enter or a minimum amount that you have to deposit. After completing the first four steps you're ready to start playing. All that's required now is choosing which table to join. Poker sites will typically list all their active cash tables and upcoming tournaments in a part of their software called, "The lobby." This tends to be where you're directed when you first log in and you can usually customize it to only show the games you're interested in. You could set it so that you just see sit and go tournaments for example, or only no limit Texas Hold'em cash games. You could also set it to display only games with a specified range of stakes. If you select a cash game from the lobby, you'll be taken straight to the relevant table. You'll have to pick a seat and enter the amount you wish to buy in for, but then you'll be ready to start playing. If you choose to enter a tournament, the cost of the buy in will be automatically deducted from your account. For a sit and go tournament, you'll be taken to the table as soon as enough players have entered, and for a scheduled tournament you'll be taken to the table a moment or two before the start time. This completes our guide on joining a poker site but we would like to leave you with one more thing and that is to wish you the very best of luck at the tables!